Our family has eaten variations of this noodle for generations. True Spätzle and their kin are so toothsome, tasty and filling, and they go with many different cuisines. Put ’em in soups, sauces, ragouts, or top them with grated cheese or butter. They are fantastic. And although they are easy to make, the Spätzle recipe is not so easy to find. Now you can stop searching, as Johanna from KokBlog has tested and trialed to find the perfect version. And her illustrations are so cute, they might just charm you into trying them! Heat up water until it’s just lukewarm. Mix together eggs, water, nutmeg and a pinch of salt. Gradually start adding flour, little by little. Make sure to avoid creating lumps. The dough has enough flour when it’s a little stretchy and easily drips off your spatula without breaking. If you get the dough too stiff, just add some more water. Let the dough rest for about half an hour. There are many different ways to “form” the spätzle and it’s probably very individual which method you may prefer. Using a spätzle lid is the easiest and the kitchen doesn’t ends up in a mess (see image above). 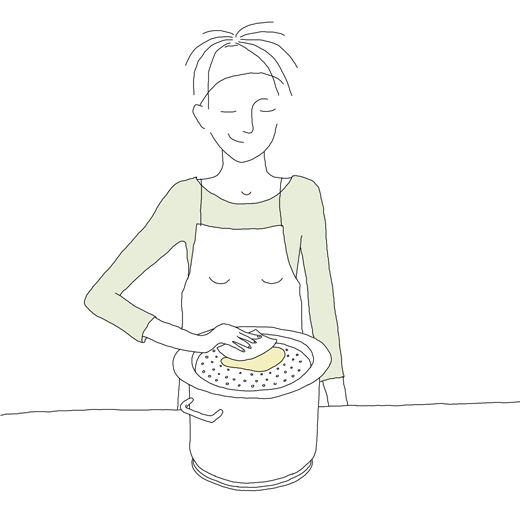 Heat up some salted water in a large pot that will fit the spätzle lid nicely (see below for other methods). Bring the water to a boil. Lower the heat. Place the lid on top of the pot and add ¼ of the dough on top. Start to press the dough down with a spatula (often comes w/ the lid). Stir around the spätzle a little so they don’t stick together. The spätzle are done after about 2-3 minutes when they float up to the surface. Use a skimming ladle to fish them out. Repeat above steps until the dough is finished. Adjust the heat if necessary. Add some melted butter to the spätzle so they don’t stick together. 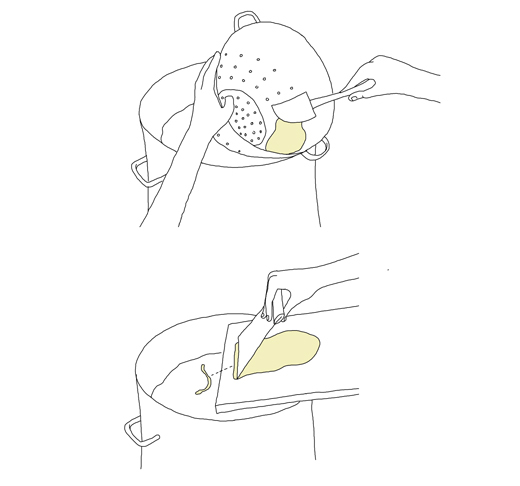 Another technique is to use a pasta strainer, preferably those with larger wholes. A stainless steel strainer worked fine, even if it was a little clumsy, the spätzle came out pretty nice, tiny and delicate! 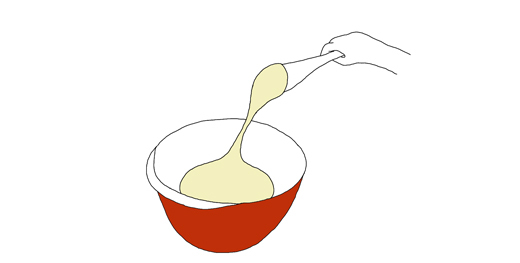 Just let the strainer rest at an angle on the edge of the pot (see image above) and use a soft spatula to press down the batter through the holes into the hot water. If you want larger spätzle you can use a smaller chopping board and a chef knife or a bench scraper. Place one batch of dough on the chopping board and let it rest at an angle at the edge of the pot. Start to cut small pieces of the dough right into the boiling water. It works okay and probably would be better with practice. We had a fabulous dinner last week at Bistro Bella Vita in Grand Rapids — showcasing their stellar risotto — and today I found this divine mushroom chevre risotto on Creative Culinary…it can’t be a coincidence. I must whip this up, to honor the memory of that meal and to banish the drear of our 40-degrees and rainy weather. Let’s get crackin’. Put 1 tsp olive oil in pan, heat pan and coat bottom with olive oil (the olive oil will melt a bit as heated and more easily cover the bottom).Sauté the sliced mushrooms until just tender, about 5-7 minutes, do not overcook! Remove from pan and set aside; leaving any juices in pan. Put 2 tsp olive oil and chopped onion and rosemary in in the same saucepan and sauté over medium heat until the onions are soft .Add the garlic and cook for two more minutes. Add the rice and sauté until it is hot and begins to become more opaque in color (approx 4 minutes). Add 1/2 cup white wine and stir, maintaining a light simmer until the wine is absorbed. Add a half cup of chicken broth, stirring the mixture occasionally while maintaining a gentle simmer and allowing the liquid to become completely absorbed by the rice. Continue to add broth, a half cup at a time. Cook until the rice is al dente and creamy (approx 18-25 minutes). When the risotto is nearly finished, add the goat cheese and stir until the cheese has melted. Add the cooked mushrooms and stir gently to incorporate. Add salt and pepper to taste and serve immediately; garnish with parsley if desired.